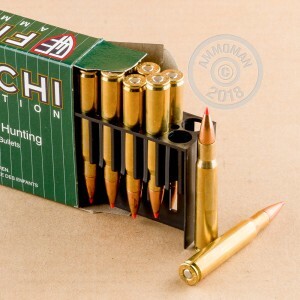 This 200-round case of hunting ammunition from Fiocchi will help you earn some big trophies during hunting season. Manufactured in Ozark, MO, each cartridge fires a 180 grain Hornady SST bullet at a muzzle velocity of about 2,675 feet per second. 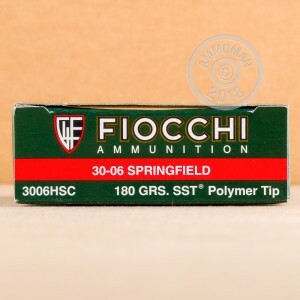 Fiocchi selected the Hornady SST bullet due to its excellent performance against deer and other game. The SST is a jacketed hollow point with an aerodynamic polymer tip that enhances both the external and terminal ballistics of the projectile. A locking ring keeps the core and the jacket of the bullet together for maximum weight retention, while a boat-tailed profile adds additional stability and wind resistance. AmmoMan.com is here to cut down the cost of your shooting. Our list prices include FREE shipping for all orders over $99 so you don't have to worry about shipping calculators or package weights. It's simple, efficient, and a huge money saver!